Vaja's i-Volution case line is legendary for not only its styling and leather quality, but also its scarce availability and high price tag. Fortunately, as we've all seen so often in the mobile tech world, imitation always remains sincerest form of flattery-and affordable imitation is always worthy of discussion. In my quest to find a slim, lightweight, and affordable daily case for my new 755p I decided to give this latest contender from Case-Mate a shot. Let's see if the affordable Case-Mate Signature Series Treo hard shell case is a viable and affordable alternative to the classic Vaja i-Volution! This and several other Case-Mate products are available for purchase from the PIC accessory store. The Signature case is available only in black (ahem, "Phantom Black") for the Treo 680, 750, and 755p for $34.95. 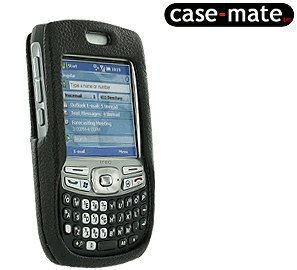 There is also a version in Phantom Black and Mocha Brown for the Treo 700 series for the same price. I purchased this case as a like-new open box "as is" from a private seller, so I cannot speak for the packaging of a factory-fresh case by Case-Mate. Upon initial inspection of this case, I was pleased to find that it was constructed of such high-quality, durable leather. By all observations, this looks to be a case designed for long-term durability. While not particularly aromatic or as soft to the touch as my previous Tumi Treo case, I loved the basketball-style pebbled leather texture wrapped around the shell of the case. It's even easier to maintain a grip on than the soft-touch paint found on the Treo 750 and 755p! Aesthetically speaking, the case is pretty much devoid of any extraneous fluff, aside from a small "Case-Mate" logo embossed on the backside and the pleasant dark red nylon interior lining that offers a nice contrast from the monochromatic exterior. Some users who have upgraded from a Treo 600, 650 or 700-series have complained that the antenna-less design of the 680/750/755 make these Treos more difficult to remove from a pocket. I'm glad to report that this case does not impede placement into a pocket nor does it interfere with removal from the pocket. All major ports and functions are completely accessible in this case. Even the side-mounted miniSD slot door is accessible while the Treo is still in the case. Unfortunately, unlikely the similar Vaja design, there is no cutout for the notification LED. The earpiece speaker is slightly muffled by the leather around it if the Treo is not positioned precisely in the case but this shouldn't be a huge deal unless one's Treo call volume is set to a very low volume. As is usual for most form-fitting cases such as this one, most docking-style accessories such as the Palm Treo Cradle Kit are rendered unusable by this case. Of course, this is to be expected and doesn't come as a surprise at all to me, so I cannot complain. My criticisms of this case's design are few and far between but the case does have one substantial, nearly-fatal flaw in its design: the bottom support bar interferes terribly with any serious typing. Hitting the spacebar, "0", and Alt keys accurately proved to be especially difficult. I managed to mitigate this problem somewhat by sliding my Treo upwards slightly to gain additional clearance from the bottom leather panel so that my fat thumbs can type more efficiently. Additionally, the extra ~2mm of thickness provides just enough protective reassurance without noticeably weighing down the Treo or adding too much bulk. A small but noticeable added bonus when using this case is that the soft leather makes for a more comfortable to rest your cheek against than the hard plastic of the phone. Vaja style without the Vaja price! For the most part, Case Mate has produced a superb case for Treo owners who want a slim, lightweight, no-frills leather shell case. For the time being, I'm going to continue to carry the Case-Mate daily until a more compelling alternative comes along that permits less encumbered typing. I just wish that I didn't have to "adjust" it prior to composing e-mails or SMSs longer than one or two sentences. Click on the Start New Comment button below to begin a discussion. You must be registered and logged in to add comments.